The 10-year Treasury note yield rose above 3% on Wednesday for the first time since December of 2013. Investors had been expecting the 10-year’s yield to eventually hit 3% for the past couple months as inflation expectations rise and the Federal Reserve hikes interest rates and trims its balance sheet. While the 3% number is mostly psychological, a rising “risk-free” rate means that interest rates across the United States will continue to rise, making borrowing more expensive and investors more skittish about buying equities. Indeed, Wednesday saw a sharp sell-off in stocks, and the dollar hit a 3-month high, as higher Treasury yields prompt greater demand for dollars. The 10-year closed the week just below 3%, finishing at 2.96%. Google’s parent company Alphabet (GOOGL) delivered Q1 earnings beats on both the top and bottom line, but one-time profits and expenditures clouded the picture. The company beat Wall Street revenue targets, with a 23% year-over-year growth in revenue, and also crushed EPS expectations. However, Alphabet finished the week down 4.3% in spite of earnings beats. Analysts attributed this to Google’s acquisition of HTC, the Waymo-Uber settlement, and a markup of Google’s stake in Uber, as one-time profits and expenses make it harder to compare Q1 performance to that of past quarters. However, the most important factor that drove Alphabet’s stock down was their shrinking operating margins. While Alphabet and other tech giants have garnered massive valuations due to the fact they act as near monopolies, and so have hefty operating margins, that is starting to change as companies like Facebook and Google start to compete for dominance in the online advertising space. This competition, while good for consumers, will mean lower operating margins for Alphabet, which means a lower stock price. Sprint (S) and T-Mobile (TMUS) announced merger plans on Sunday, agreeing on paper to a $26.5 billion merger. The deal is the third attempt by the two companies to merge since 2014; the first attempt was scuttled due to antitrust scrutiny from the Obama administration, and the second attempt broke down after the two sides couldn’t agree on how to structure control of the new company. However, the deal still requires approval from the Justice Department and the FCC, both of which stymied a deal in 2014 after claiming that competition could be harmed if Sprint and T-Mobile were allowed to merge. Q1 GDP growth in the U.S. was 2.3%, beating the consensus expectation of 2.0%. While GDP growth slowed from an annualized rate of 2.9% in Q4 of 2017 to 2.3% last quarter, and though the 2.3% figure is a far cry from the 5.4% predicted by the Atlanta Fed in February, GDP growth in Q1 was good considering the expectations. At one point, UBS predicted that GDP growth in Q1 would be 1.4%, and Q1 GDP growth tends to be lower due to quirks in the seasonal adjustment process. Additionally, GDP growth last quarter was faster than GDP growth in Q1 of 2016 and 2017. Amazon (AMZN) announced it would be raising the annual fee for Amazon Prime 20% to $119. The hike comes after Amazon smashed earnings expectations for Q1 of this year, earning more revenue than expected, with year-over-year revenue surging 42%, and doubling its net income. Amazon even beat its EPS expectations by a whopping 160%. The news comes after CEO Jeff Bezos disclosed in a letter to shareholders that the company has over 100 million Prime members and growing (although some Prime members have expressed dissatisfaction with the price hike). With the profit spigot continuing to flow, many analysts expect Amazon to continue to decimate consumer retail giants like J.C. Penney and Sears. Amazon’s stock finished up 2.9% for the week. US benchmarks had another mediocre week. The Dow Jones Industrial Average (DJIA) finished down 0.6% for the week, the Nasdaq Composite (COMP) closed down 0.4%, and the S&P 500 (SPX) finished down <0.1%. European indices had a much better week than their US counterparts. 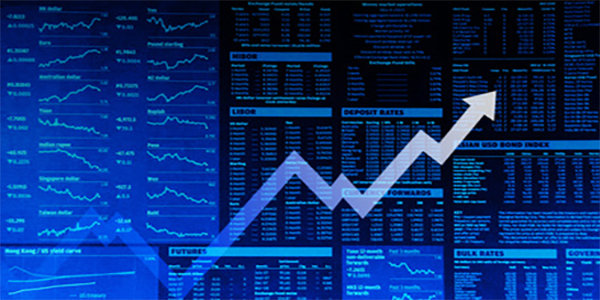 The UK’s FTSE 100 Index (FTSE) finished up 1.8%, and the German DAX Index (DAX) closed up 0.4%. Asian markets had a mixed week yet again. Japan’s Nikkei 225 finished up 1.4%. India’s BSE Sensex finished up 1.6% and Hong Kong’s Hang Seng closed down 0.6%. If markets are any indication, global synchronized growth may be coming to an end. For the past year or so, the global economy has been humming along, with strong economic growth across the world. In fact, in November of 2017, worldwide business optimism hit a three-year high. Euphoria about global synchronized growth was so prevalent among investors that it propelled U.S. indices to all-time highs in January. Even as U.S. stocks trade off their January highs, many fundamentals for multinational businesses remain strong. Earnings growth for the 250 S&P 500 companies that have reported Q1 earnings so far was 22.9%, far higher than the 11.3% expected at the start of the quarter. However, in spite of strong corporate earnings, macroeconomic forces have started to cloud the worldwide economic picture. While GDP growth slowed in the U.S., the U.K had a far worse slowdown, with annualized GDP growth in Q1 slowing to just 0.1%. This is a bad omen for Europe, which only a couple years back began to really recover from the Great Recession; real GDP in the EU didn’t even reach its Q1 2008 level until Q3 of 2014 (for comparison, the U.S. reached its Q1 2008 real GDP level by Q4 of 2010). GDP growth in China also continues to slow, a trend since 2007. In addition to slowing GDP growth, inflation also looms large on the horizon, particularly in the U.S. (as has been noted in previous editions of Last Week in Markets). In Japan, deflation continues to persist; while Prime Minister Shinzo Abe has worked to bring Japan out of the throes of deflation, the Bank of Japan recently announced it would no longer try to predict when inflation would hit 2%, a sign the country still has a ways to go to to bring up inflation. These factors, along with others, have contributed to diverging equities markets. The figure above charts the paths of the S&P 500 (“US:SPX”), the Shanghai Composite (“CH:SHCOMP”), the BSE Sensex (“IN:1”), the FTSE 100 (“UK:UKX”), the Nikkei 225 (“JP:NIK”), and the DAX (“DX:DAX”) over the past year. The six indices moved very closely together for much of the latter half of 2017, and while they diverged towards the end of the year, all were in positive territory. However, since the plunge at the end of January, markets have significantly diverged; Japan and India are on the path back to their January highs, while Germany and China remain stuck in the doldrums. The U.S., meanwhile, is stuck in the same place it was in February. Part of this is due to bond yields; rising bond yields in the U.S. have contributed to a divergence in bond yields across the world; while the 10-year Treasury note remains near 3%, the 10-year German government bonds sits below 0.6%, and the 10-year Japanese government bond is all the way down at 0.06%. As bond yields in the U.S. have risen significantly above those in Europe, European investors have rotated their money out of European equities and into U.S. bonds, a trend unlikely to disappear anytime soon. As the global synchronized growth euphoria dies down, investors are starting to scrutinize the economic fundamentals of each country more closely. If markets are any indication of where things are headed, for some countries, economic fundamentals are likely to remain strong (most notably India), while for others, economic cracks could be forming, meaning the short-lived period of global synchronized growth may be tapering off. The T-Mobile-Sprint merger will be the first major antitrust test for Trump’s Justice Department. T-Mobile and Sprint have been trying to make a merger work since 2014, and, for various reasons, negotiations have fallen apart. One of the primary drivers behind the collapse of merger talks in 2014 was regulators’ claim that a four-competitor wireless market leads to greater price competition and innovation, and the two companies were unable to convince regulators that this wasn’t the case. As such, merger talks fell through, but this recent deal marks the first time that both companies have actually agreed to a formal deal, meaning that in order to prevent the deal from going through, the DOJ would need to sue T-Mobile and prove their case in court. Circumstances are also different than they were in 2014. As the race for 5G networks heats up, T-Mobile and Sprint are pitching this deal as a way to beat China in the 5G race through large investments in 5G networks that neither company has the financial means to be able to do individually. Additionally, Sprint continues rely on junk bond financing to keep itself alive; annual net income has been negative since at least 2012, and the company’s debt-to-equity ratio is a whopping 217%. Although the company posted a quarterly profit in Q2 of last year, its continued cash burn may make a T-Mobile acquisition inevitable if the company goes bankrupt. Having said this, much of the DOJ’s opposition to a deal between the two companies in 2014 remains on solid ground, and heavy layoffs are expected should the deal go through. With a deal now in place, it will be up to the Trump administration to decide to pursue litigation or allow the deal proceed. The administration has already taken a number of steps to crack down on large M&A deals. The DOJ is currently battling AT&T in court to prevent its acquisition of Time Warner (though it looks like AT&T will likely win the case), and the President himself took the extraordinary step of unilaterally blocking Broadcom’s acquisition of Qualcomm on “national security” grounds. The majority shareholders of both T-Mobile and Sprint are foreign, and although their executives have pitched the deal as promoting greater investment in America, a deal between foreign companies that would lead to heavy job losses in America might be enough to prompt Trump to block the deal.